Franklin Sanders is the pastor of Christ Our Hope Church in Westpoint Tennessee. Franklin leads their prison ministry – an investment of time and resources which is doing great good. Every month I tithe a donation to the prison ministry to purchase Bibles for the prison inmates who have earned them with the good Reverend Sanders. I get regular e-mails on ministry trips to prisons and the fruit of their labors. Franklin joined me on the Solari Report in 2014 to describe his prison ministry. You can access it here. Franklin just sent out a request for donations so he can make a bulk purchase of Bibles. This is a donation that will have real impact. If you want to support me in doing our bit to make sure that no one stands alone is this world, here is an opportunity to do so. Seldom do I ask y’all for favors, but now I need to. Our Church has a jail and prison ministry that gives to inmates very useful study Bibles in the English Standard version. In the last four years we’ve sent out more than 2,000 of these Bibles. Over and over inmates write back thanking us for a Bible they can read and understand. This Bible is a vital tool, with cross references, notes, book outlines, concordances, and every tool needed for serious study. Those that receive these Bibles can prove to themselves that the Gospel speaks directly to their needs, and that Christ knows and bears all their sorrows and sufferings. Yes, I understand that most folks consider jail and prison inmates to be nothing more than human trash, but we don’t just throw Bibles at them. We respond to their requests with a letter asking them to vow to God and themselves that they will read the Bible twice a day and pray. We also ask them to form prayer and study groups with at least two other cellmates, and to practice holy living. Does every single one keep that vow? Of course not, but some do, and some become new men and women. We have the letters to prove it. You would call these “splendid Bibles” with a fine leather cover, the best gift some of these inmates have ever received. Our supply of 500 bought early this year is nearly exhausted. To get the special $28 price—these Bibles retail for $60—we have to buy 500 copies. The paperback version is much cheaper, but is unwieldy and quickly falls apart. I know twenty-eight bucks for a Bible sounds like a lot, but if you drive a car, you think nothing of spending $28 to gas up. If you have a family of four, you couldn’t get a meal at McDonald’s for $28. Please consider with compassion: many of these inmates have alienated their families and sit destitute in prison. That Bible opens a window on a whole new universe and shows them that love is not a lie. Every penny you give goes directly to buy and ship Bibles, nothing else. Letter writing and shipping is done by volunteers, so there’s no administrative overhead. This is not merely our Church’s project: contributions come to us from across the Gospel-believing spectrum. 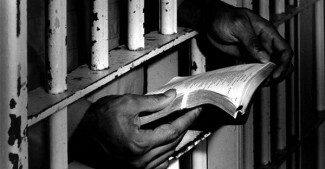 A Bible delivered to an inmate costs $32.19 with postage. I know it’s not Christmas time, but would y’all help us send the gift of the Word to these inmates? It is a gift that will feed them all the rest of their lives. Every $32 you send will buy and deliver another Bible, and, yes, you can buy more than one Bible for the inmates. You can buy two or five or twelve or a hundred—as many as you want. We won’t send back any checks because they’re too big or too little. And thanks for opening your hearts enough simply to read my request.